Grand prize in the Virginia Institute of Marine Science’s annual Marine Science Day Art Contest goes to Lauren Wheeler, a 10th-grader at Grafton High School. The contest offers community members of all ages a chance to design the artwork for VIMS’ biggest event of the year, which this year focuses on the Institute’s 75th anniversary. This year’s Marine Science Day celebration will take place on Saturday, May 30th and will feature new anniversary-inspired activities, including the opportunity to interact with a digital timeline of VIMS history. VIMS Professor Eric Hilton, an internationally known expert on fish anatomy and evolution, says VIMS has several specimens of gulper eels in the VIMS Ichthyology Collection, and several different specials will be on display during Marine Science Day. Professor Deborah Steinberg—who studies how the rain of organic material from sunlit surface waters affects deep-sea food webs—agrees with Hilton and says she was impressed to see Wheeler’s depiction of the gulper eel’s bioluminescent lure located at the end of it’s whip-like tail. Hilton says together with their large mouths, gulper eels have distensible stomachs that form a pouch and can accommodate very large food items. “The scientific name of the taxonomic order they belong to, the Saccopharyngiformes, is Greek for ‘bag throat’,” he says. 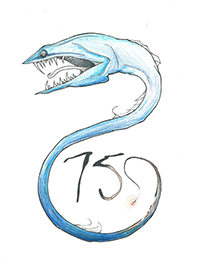 Wheeler says her passion for marine biology—and the deep sea in particular—was her inspiration to draw the gulper eel. “I love the intricate designs of deep-sea creatures, and the gulper eel was something that attracted my attention because it is such a strange and unique animal.” Her original idea was to draw a goblin shark, but then decided the gulper eel would be more fun and interesting to draw. In order to meet this year’s requirement to include the number “75” in the artwork, Wheeler created her own special font. “I wanted to make sure the number 75 matched the design, so I created the font and tried to make it interact with the eel’s tail,” she says. 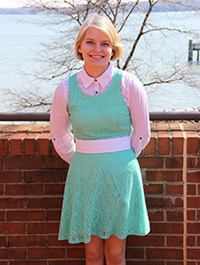 In addition to her interest in marine science and art, Wheeler is also a writer, and is currently working on several different stories. “Writing is also something I definitely plan to pursue in my future,” she says. Wheeler’s Grand Prize artwork will be used in advertisements and featured on the official 2015 VIMS Marine Science Day T-shirt, with limited numbers of these on sale in the VIMS Gift Shop during the event. VIMS is still accepting votes for its “People’s Choice Awards,” a separate category of the Marine Science Day art contest. The kid’s and adult artwork that receives the most "likes" on the VIMS Facebook page between now and May 16th will be recognized along with Wheeler and other contest winners during the Marine Science Day awards ceremony on May 30th.